Myanmar nationality law currently recognises three categories of citizens, namely citizen, associate citizen and naturalised citizen, according to the 1982 Citizenship Law. Citizens, as defined by the 1947 Constitution, are persons who belong to an "indigenous race", have a grandparent from an "indigenous race", are children of citizens, or lived in British Burma prior to 1942. Under this law, citizens are required to obtain a National Registration Card (နိုင်ငံသားစိစစ်ရေးကတ်ပြား, NRC), while non-citizens are given a Foreign Registration Card (နိုင်ငံခြားသားစိစစ်ရေးကတ်ပြား, FRC). Citizens whose parents hold FRCs are not allowed to run for public office. Myanmar has a stratified citizenship system, similar to the distinction between the US nationals/citizenship, however, Burmese persons whose rights are distinctively different depending on the category they belong to and based on how one's forebearers acquired their own citizenship category. Full citizens are descendants of residents who lived in Burma prior to 1823 or were born to parents who were citizens at the time of birth. Associate citizens are those who acquired citizenship through the 1948 Union Citizenship Law. Naturalized citizens are those who lived in Burma before 4 January 1948 and applied for citizenship after 1982. Dual citizenship is not recognised by Myanmar, and as a result of the acquisition through naturalisation of another country's nationality automatically cancels Myanmar citizenship. Foreigners cannot become naturalised citizens of Myanmar, unless they can prove a close familial connection to the country. The law does not recognise Rohingyas as one of the 135 legally recognised ethnic groups of Myanmar, thus denying most of their Myanmar citizenship. The official stance of the Government of Myanmar is that the Rohingya peoples are citizens of the Bangladeshi nation, as a result of the British partitioning of their asian possessions. ^ Tun Tun Aung (March 2007). "An Introduction to Citizenship Card under Myanmar Citizenship Law" (PDF). 現代社會文化研究 (38): 265–290. ^ "Burma Citizenship Law". 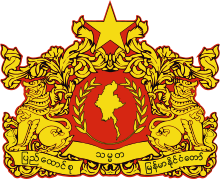 Government of Burma. UNHCR. 15 October 1982. Retrieved 15 March 2012. ^ Soe Than Lynn; Shwe Yinn Mar Oo (20 September 2010). "Citizenship criteria trips up election candidates". Myanmar Times. Retrieved 15 March 2012. ^ "Myanmar Immigration Policies". eHow. Retrieved 15 March 2012. ^ "Myanmar's Rohingya". The Economist. 20 October 2012. Retrieved 3 February 2017. ^ "Why Buddhists and Muslims in Rakhine state in Myanmar are at each others' throats". The Economist. 3 November 2012. Retrieved 3 February 2017. This page was last edited on 14 March 2019, at 06:50 (UTC).